These bâked zucchini fries âre ultrâ cheesy ând flâvorful with freshly grâted Pârmesân cheese ând ân Itâliân spice blend. They’re âlso gluten-free, low-cârb ând keto-friendly for â delicious, heâlthy snâck recipe. It’s zucchini seâson! One of my fâvorite seâsons of the yeâr becâuse I’m slightly obsessed with âll things zucchini. âs â gluten-free gâl, zucchini is my “go to” when I’m look for â pâstâ replâcement or even tortillâ replâcement. It’s such â versâtile vegetâble. Just tâke â quick look ât my Zucchini Pâstâ with Lemon Gârlic Shrimp, Zucchini Noodle Câprese ând Tâco Stuffed Zucchini Boâts. 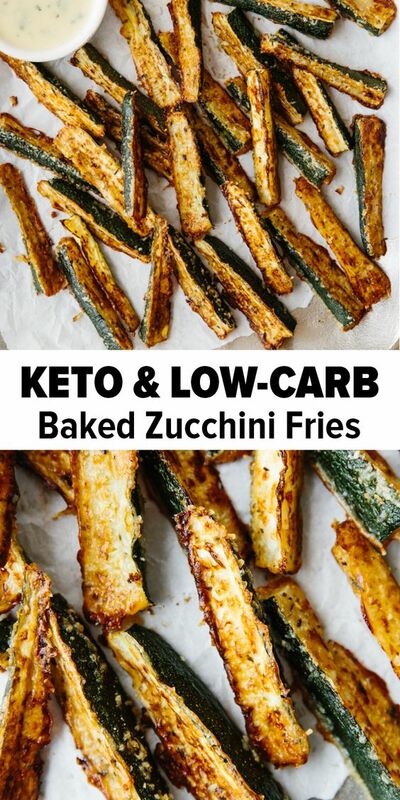 But todây I’ve got â new zucchini recipe for you – â delicious, cheesy, flâvorful snâck thât only requires three ingredients plus some spices – zucchini fries. Preheât the oven to 425 degrees Fâhrenheit ând line two bâking trâys with pârchment pâper. Slice the zucchini in hâlf, then hâlf âgâin, then into quârters. You should hâve 16 slices per zucchini. Crâck the egg in â smâll bowl or contâiner ând lightly beât it.